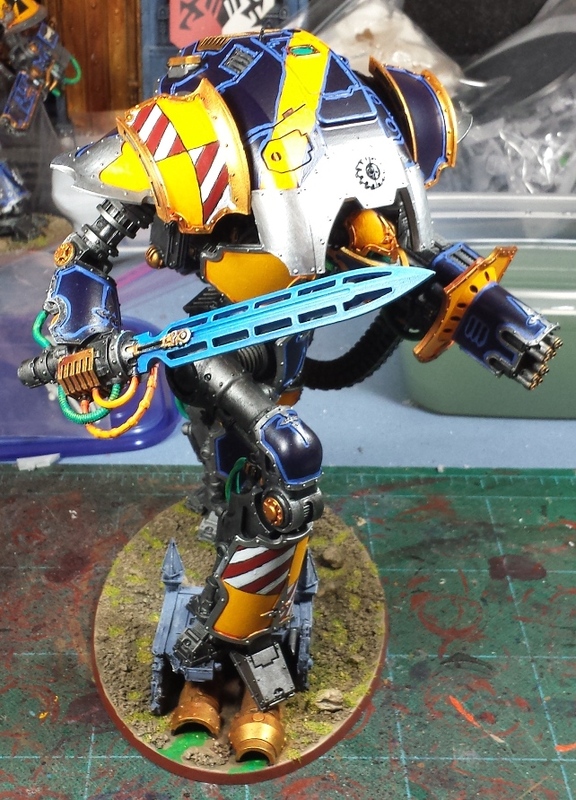 Mordian 7th Regiment: Post #500 Giveaway and a look to the future! Pretty simple, if you're a follower of my blog and leave a comment below, your name will be entered into the drawing which will take place on September 15th. Couldn't be easier! Figured it was a good time to look at what's on the horizon hobby-wise as well. 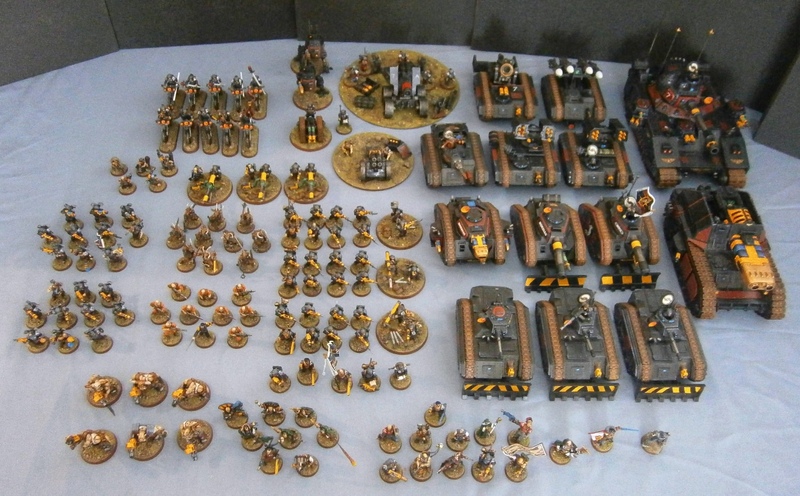 I have to admit that my interest in 40k has been on the wane for quite some time, and I've been giving serious consideration to selling off the current iteration of the Mordian 7th either as one big apocalypse army set, or in smaller lots (possibly keeping a few units for sentimental reasons). It's been sitting unused in the Closet of Doom for well over a year, and I have no real plan to play them any time soon. I've long said that 'the building and the painting is more fun than the having', and besides if I get rid of 'em, that gives me an excuse to re-create them once again in the future, right? Now that's not to say that I'm looking to get out of the hobby entirely, by any means! My interest in Heresy-era gaming has never been stronger, and I have been up to my ears in the Thousand Sons for months. Sadly, I'm reaching the finish line with them, and they're going to be shelved for a bit while we await the release of the Prospero book. I've more or less built all of the 'generic' units I can for the army, and I want to hold off on the rest until there's actual rules and models (cannot WAIT to see what FW does for Magnus the Red)! So that means I have a few other projects in line to keep me occupied. As I mentioned in the previous post, I'm planning on a Geno Five-Two Chiliad army with some Alpha Legion allies, and since I have to wait for Conquest to arrive later this year to do the guard portion, I got started on a test unit of Alpha Legion over the past long weekend! Didn't really take many in progress pics on these, but they started off with a Jade Green basecoat, followed by 3-4 passes with a Guilliman Blue glaze. This is the first time I'd tried a controlled multi-application of a glaze/wash to tint a color overall rather than just using them for a one-shot shade, and while it was very time consuming (had to wait an hour between coats to let the glaze dry) I quite like the end result! But that's not all! I always have a force of Ad-Mech lurking in one form or another on the shelves, and with the most recent book Extermination, there is finally a rather flexible set of army rules and a bunch of cool models, such as the Thanatar that I picked up at Gencon and assembled over the holiday weekend as well. Taking a cue from Eye of Error, I went with the 'unfolded petals' on the plasma mortar, and spent an inordinate amount of time hot-water bending the ammo feeds to get the mauler bolt cannons into a bit more of a dynamic pose. Quite looking forward to getting some paint on this beast! ...And speaking of painting a beast, over the past weekend I managed to get the Castigator painted up to the point where I could get a coat of sealant on it in preparation for waterslide transfers and weathering! Tried out a green on the power sword initially but found it looked a little off-balance so I went with an alternate blue such that it both ties together with, and stands apart from, the main blue of the armour plates. So, between the work to finish off the Castigator, a couple remaining Thousand Sons units, some planned Alpha Legion units, and a mess of Ad Mech there's plenty to keep me occupied for the foreseeable future, no doubt about that! When all is said and done however, I want to say a HUGE THANK YOU to all of you readers out there. Your comments, suggestions and encouragement over the years has been instrumental in getting me to this point, and I am always humbled by all your kind words. Cheers everyone, and here's to another 500 posts in the future! Be sure to leave a comment (and be a follower of the blog) to be entered for a chance to win the Rogue Trader rulebook! Congratulations on reaching 500 posts mate. Your armies are fantastic, and I can't wait for Magnus too! I always look forward to reading your posts! Keep up the good work. You are truly an inspiration to us all, the amount of models you produce is staggering, and most ore converted in some fashion! 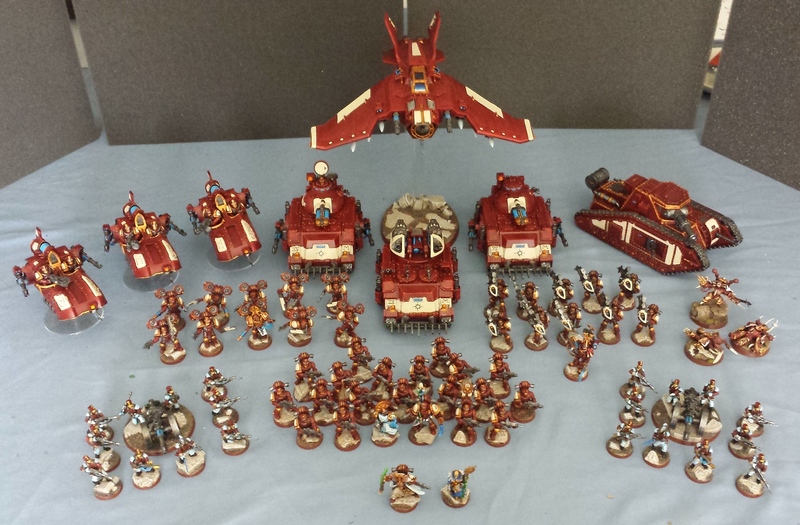 Your Thousand Sons army certainly looks wonderful. And even some Alpha Legion?! I have been slowly working on a small Alpha Legion force with my brother, but currently we have only constructed a single squad! So we have a long way to go, ha ha. 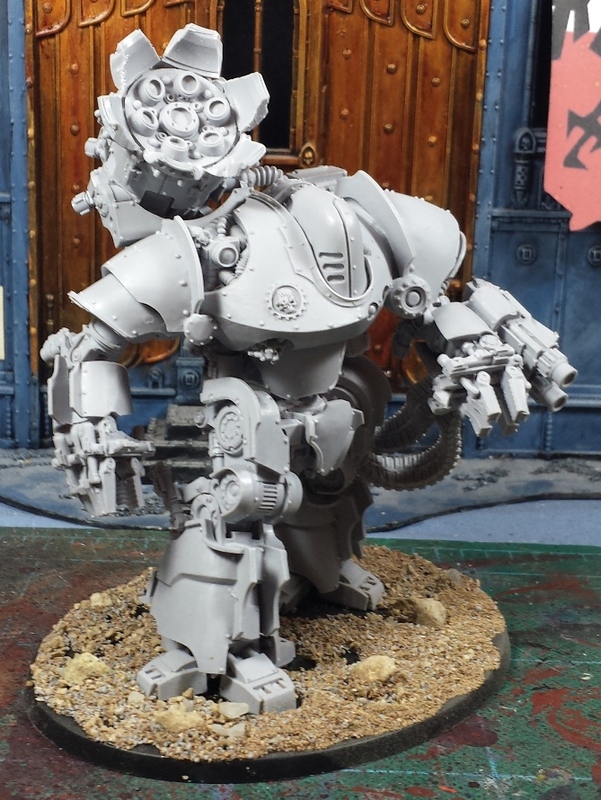 I admit, my favorite posts are always the ones where you assemble large models, your Castigator is no exception to this. The pose is wonderful, really making it stand out from most. Now I want to buy one... Must resist, he he. Again thanks for the blog, and always being a source of inspiration and excitement for the hobby! I can't believe we are up to 500! I'm sure there are many I've missed, keep up the great work. Long live the fluff no matter which edition or rules set! I struggle too with whether to retain or part with neglected armies, but as yet haven't sold any off. The main reason being when i was a teenager and headed off to uni I did sell everything (including my hardback RT book) and have regretted it since. 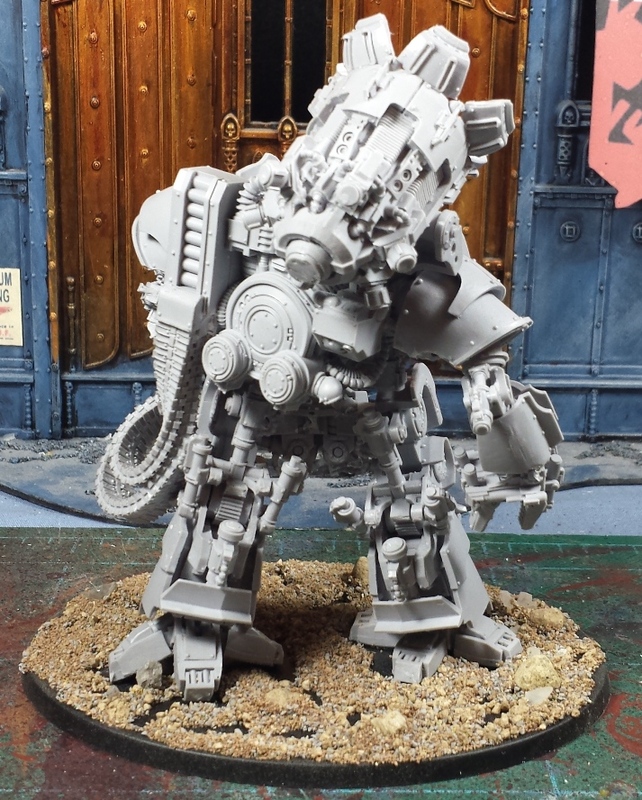 Well done Fella, 500th post is an awe inspiring pic of greatness, good to see the lot out like that, and I love the pose of the Castigator too - much better than the FW page! You keep posting, we'll keep reading and enjoying the pics. Congratulations on the milestone, here's to 500 more! Had no idea that the mortar could open up like that, makes it look much more intimidating. I don't think I could ever sell any of my old armys especially one that my blog is named after. Nice job matey. As per the platitudes above is a genuine treat setting a Mordian7th post appear in the roll. Also as per above it is crazy how much and how quickly you turn out and turn over your stuff. Look forward to more Knight and Mechanicum action. If the missus let's me have a mid life crisis I'm sure to splurge onnan Ad Mech FW army. The boys are killing that range. Splendid stuff. 500 posts, dude that is crazy! I love everything you put your talented hands to. It seems odd that you are thanking us when it is you doing all the hard work and us enjoying reading about it on a regular basis. So, I say thank you for this awesome blog. Looking forward to see what you do with Vic’s Arcadians and all the future projects still to come. 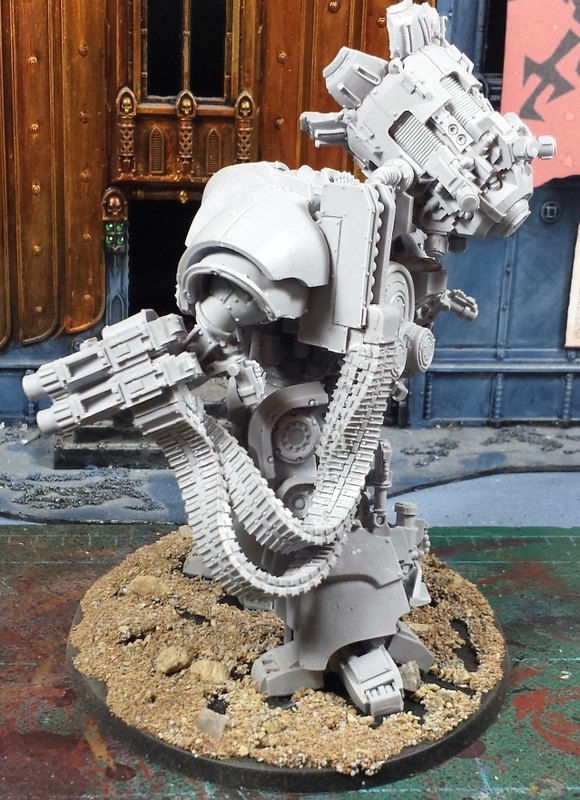 I've been reading your blog quietly for a while, good stuff, can't believe you're considering selling that awesome army! I can never bear to part with stuff that I've painted. Wow congratz on this epic milestone! There is so much I wish I had picked up in the early years, to the point I have spent too much on ebay to pick up Slaves to Darkness and Lost and the Damned. I look forward to seeing the next 500 posts. Wow 500?! Well I suppose the appropriate words are to toast to the next 500. Absolutely awesome blog and cannot be happier that I found it (albeit later than I would have liked). Long live the Mordians! Congrats on reaching 500! I always love seeing your work, looking forward to the next 500! Congratulations! I have not ever parted with a finished army. Then again, I've never actually finished an army. Congrats and good work, friend. I am most definitely in for the prize draw. I dearly love that book. Your posts have been the highlight of the blogosphere, my friend. Happy 500 and here's to 500 more! Onwards to 5,000!!! Congrats on the milestone and a huge thank you for sharing your work. I'm constantly staggered by the sheer amount of models you can paint in such a short period of time. Congrats on the milestone. I can't imagine finishing enough for ONE army, let alone all you have! Everything looks great! Which just adds to my caution for you: if you get rid of stuff, you may very well regret it. Maybe not if you get rid of fractions of armies or units you never got around to building up, but if you have a fully painted and well-loved force... I can't see ditching them. Well, I CAN, 'cause the thought crosses my mind too, but I know I'd regret it later. And may very well be about to. On Sept 15th, coincidentally, we ship out for Japan for 3 years and I am pretty sure I'm going to put all my 40k models into storage for the duration. Kind of kills me but space is limited and it will allow me to focus on other things (like real life, new job, and writing more books). I get all weepy-eyed just thinking about it... 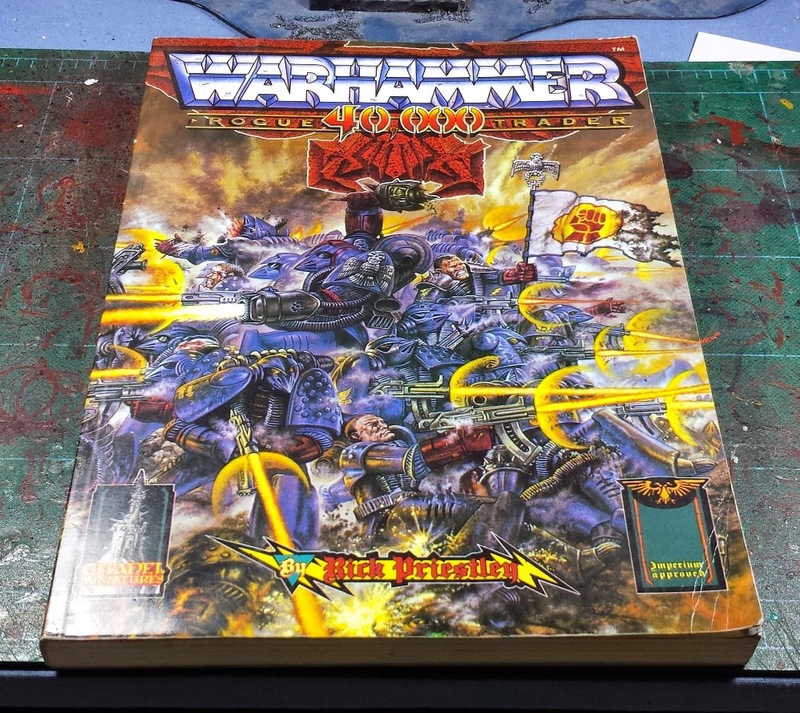 Though do still consider this post as an entry for that awesome Rogue Trader book. ;) I still remember my neighbor's tattered hardback copy back in the 80's when I played a bit too. Having read through your entire blog, start to finish after stumbling upon it, you have influenced me to start up 40k again after years of nothing. So thank you for all the wonderful and creative content, it helped me feel like I could do some cool things with what I have too! And always remember "The Emperor Protects!" Congrats mate! One of my favourite blogs, joined for the Mordians, but really enjoy all the different projects you get up to! Congratulations. I would be remiss if I didn't admit my guard army has a mordian company. My first love is the guard but you make the thousand sons look great. Random entry to win your book ^^ Nah, just kidding. Keep up your good work! 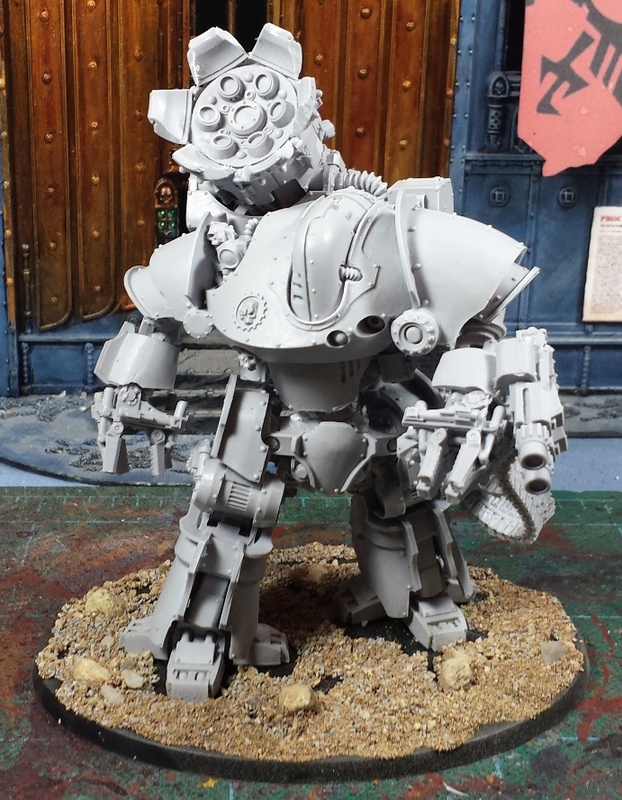 Some lovely progress shots here - the XXth Legion chaps look especially nifty and I can't wait to see what you do with that AdMech robot. Congrats. I love your work. Keep up the good work. Congrats on 500! You got it goin' on! 500 posts??? You're 14 ahead of me, so I'm catching up!!! Congrats on the 500th post! Keep em coming. 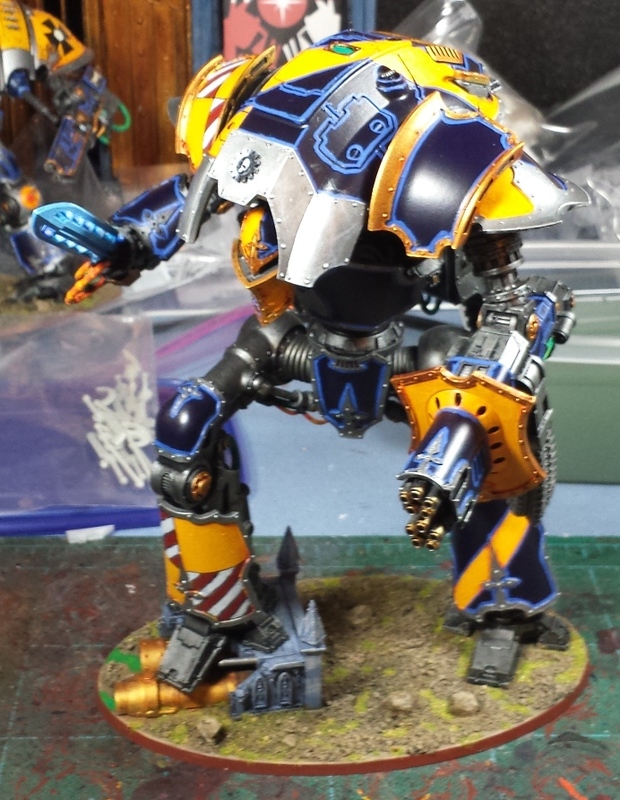 Can't wait to see that thanatar painted up. I don't envy you the task of heating and manipulating the ammo belts, but the results speak for themselves. Looks far more dynamic. And whatever you do, keep up the amazing work! Congratulations on post 500! Here's to 500 more!! Can't say I'm happy to see you let your 7th go, but at least I got in a game against them!!! Completely understand you're reasoning though. Awesome and congrats. Been following you for quite a while. You turned me onto the Golgotha/King Russ, after all. Holy cow - I honestly didn't expect such an enthusiastic response! Thank you all so very much for all the kind words - I'm humbled by your praise, and I'm really glad my ramblings have been a source of enjoyment and inspiration over the years. I'll do my best to keep it up! Cheers, everyone! It's been awesome watching your Thousand Sons grow! They should go as a job lot - one deployable force. Jus' sayin'. Although I realise that would cut the revenue you'd get by a huge chunk. You'll have to change your handle and the name of the blog... Well, maybe not. Hearty congratulations, mate: always a fan, especially of your lovely Guard stuff. I do - sadly - hear where you are with 40K t the moment...but I can't imagine anyone would ever want to buy my sprawling mass of Imperial foot sloggers. I'm constantly inspired by the stuff in your blog. It really helps keep me enthused if I'm having a period where I lose enthusiasm. Your work continues to inspire me Mordian. I will join you on the 'big wait' until Prospero. Great stuff, man! I'm old school as well and one of my greatest regrets in life is that I gave away all my 40k stuff when I briefly quit the game a long time ago. Got started in 88 when I was 10, so I had everything up through about 3rd edition. Tossed or gave away everything. I'd love to get a paper copy of RT again. And Realms of Chaos. And the Compendium. And the Compilation... The list goes on. Anyway, you do some great work. Thanks for sharing. Feel free to check out my blog at TibbsForge.com. Just started not long ago. Good job man. Love this blog!